Ever since I bought a really expensive waffle iron, I've been itching to try something new to make with it. Don't get me wrong--my Pecan Cookie Waffles are still a favorite; well worth the million dollars that I plan to didn't win with them! ;) I guess I just need to justify the purchase. And why not, if it means warm, crispy, yummy waffles? Besides, I need a short hiatus from the sweet potato recipes (I have three more to share!). Several weeks ago, I was watching yet another Throwdown with Bobby Flay. This was the one where Bobby was up against the Waffles and Dinges guy in New York. This guy makes a unique waffle called a "Liege" waffle. It is a Belgian waffle, but not like an ordinary Belgian waffle. Typically sold from street vendors, this is a yeasted waffle, all fluffy on the inside and crispy on the outside. The really unique thing about them is that they are filled with Belgian pearl sugar that caramelizes on the outside and gives a nice satisfying sweet crunch to the middle. Can we say Yum?!! Since the Waffles and Dinges guy isn't about to share his secret recipe, I found several versions on the Internet. The resulting recipe is a mash-up of my results...and they turned out quite well, if I do say so. Not to be confused with Belgian Waffles, these yeast based beauties are made with pearl sugar...resulting in some of the best caramelized, sugary confections known to man. Mix the yeast, water, and sugar in a medium bowl and allow to rest for 15 minutes. Whisk together the flour and the salt in a separate large mixing bowl. Make a well in the center of the flour. Pour the yeast mixture into the well and and mix until well-blended. Stir together the butter, vanilla, and cinnamon, if using. Add the eggs (one at a time) alternately with the melted butter, mixing well after each addition. The batter will be thick and sticky. Loosely cover the bowl and let the dough rest in a warm, draft-free area until it doubles in size. Gently fold in the pearl sugar and let the dough rest for an additional 15 minutes. While the dough is resting, heat the waffle iron (be sure to use a Belgian waffle iron). Spoon about 2 tablespoons of dough into the center of the waffle iron. Bake for about 3-5 minutes (follow the directions per your waffle iron). * Try to find authentic Belgian Pearl Sugar. It is larger than Swedish Pearl Sugar and works much better in this recipe. I found mine at a local kitchen specialty store, but you can also find it online. Mix the yeast, water, and sugar in a bowl and allow it to develop or sit for 15 minutes. Adding the eggs one at a time is easy if you've cracked them into a bowl or measuring cup first. I mixed the cinnamon and vanilla in with the melted butter. Gently fold in the pearl sugar and let the dough rest for 15 more minutes.While the dough is resting, heat the waffle iron. Spoon about a 2" ball of dough into the center of the waffle iron (this should yield a waffle that is about 4" in diameter). Waffles will take 3 to 5 minutes to bake. 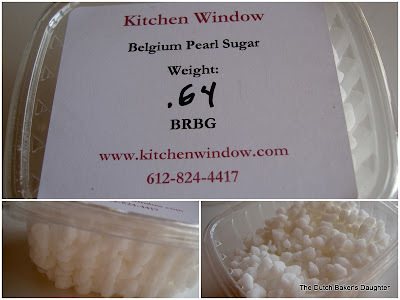 I actually found some real Belgian pearl sugar at the Kitchen Window...it's really not the same as the Swiss version. One thing---my waffle maker was quite the mess, what with all the melted sugar. It took a little elbow grease to get it cleaned off. Best to do it right away, while the iron is still warm. Mighty good looking waffles, I'd love some for breakfast now. Can you please help me find Shane, I'm new here & would love to read his blog too. Oh my gosh, Dajana, I didn't think to check Shane's blog. Why didn't I remember that? I'll bet his waffles are perfect! I saw the Fan had a good recipe for some Friesian sugar bread awhile back. Have you tried that? I may have to use the rest of my sugar on that. I have been searching for a recipe for Liege Waffles and want to give these a whirl. I'm just looking for clarification on an ingredient. With the Butter. Is it supposed to be 1Cup Butter, Melted or is it supposed to be 1Cup Melted Butter. I appreciate the help. Thank you. It should read 1 cup butter, melted. :) Good luck..I've been thinking of making these again soon..they are so good! Wow, those look and sound awesome! I've never even heard of "pearl sugar". Interesting for sure. I did try a recipe of Shane's for yeast waffles some time ago, but they didn't have the pearl sugar in them. They were tasty. I have seen yeasted waffles before, but never with the pearl sugar. They sound delicious! Well I am certainly not a liege waffle snob since I have never heard of them and I do not believe in being snobby about good food done right. It is there to enjoy and share and I am sooooooooooo glad you made and shared these with me! They look authentically delicious to me. :) I am glad you found real Belgian Pearl sugar. I used the Swedish pearls, which are a little smaller. They didn't melt as well as the Belgian does... AWESOME JOB!!!! If ONLY there was a way for me to reach into my computer screen and grab one... YUM! Oh, wait! I just remembered, I found some of the Belgian sugar right after I moved!!! OMG, I am gonna try your recipe! I just bookmarked this recipe from "whipped"...and now here is yours. I've had the real deal and I am thrilled to attempt this on my own. I just need to find the Belgian sugar, as I don't want to mail order it. Yumm..yumm..yumm... I want to try this recipe out tomorrow! I bet my kids will love it. Thanks. caramelized sugar.....YUM!! I need a waffle maker!! I tried them a couple of days ago - they were terrific! The next batch is in the bowl now! Make sure that the Belgian pearl sugar come from Belgium not from SWEDEN or elsewhere. I have tried with Lars and I end up clean my waffle iron for hours. Now I buy it online at http://www.belgianpearlsugar.com they import the belgian pearl sugar from BELGIUM! Oh my gosh, I'm so making these. How did you know I was looking for a recipe? :o) I just purchased a Belgian Waffle maker (one of those rotating ones, couldn't help myself). I don't get to visit Kitchen Window often. Do you think I could make it without the pearl sugar (at least a couple times until my waffle maker is broken in)? Thanks!! I would suggest finding some large crystal sugar to substitute until you get the real thing. Sure--give it a try. It won't be a Liege waffle without the sugar, but it will be a Belgian waffle! It's been a while--I need to make these again. I'll bet they would be good with some Biscoff Spread. I made these last night and they were delish! I lived in Belgium for a year and fell in love with them. I didn't have the Pearl sugar and was too lazy to make some. I had sugar cubes and cracked them and it worked out just fine. A word of caution though. You will eat them as quick as the cool off! I'm making another batch now. Between me, my wife and son, there was nothing to freeze! I'm not joking! They are delicious with a capital D! Being a Chef, I'm super critical when folks say that something is authentic, especially because I've lived in several countries. These will take you back. Try them with the cinnamon. The taste is subtle and won't overwhelm the waffle at all. Give this recipe a try. It will soon be one of your faves!